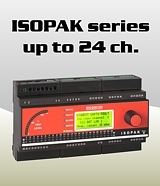 The digital controlled KCVA17x range provides precision (1.0%) reactive power and overload protection and monitoring of three phase generators. In cases where the AVR is failing - there will be an increase or decrease in the exitation voltage from the AVR. Increasing voltage give export (overload) kVAr and and decreasing voltage will give import (reverse) of kVar. 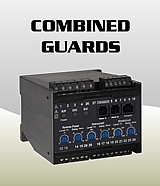 Available for 3-phase 3-wire (2R3) and 4-wire (3R4) systems. The unit measures the voltage and current true r.m.s. value, and accuracy is independent of any wave form distortion. As standard the auxiliary voltage is taken from the unit monitored voltage input. 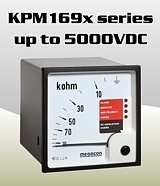 A separate AC or DC auxiliary voltage is optionally available. A green LED indicates POWER on. 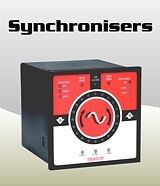 Start of monitoring function is delayed when power is switched on (default 2 secs delay). In this way false tripping during power up is avoided. Relay operation depends on the selected model. Other combinations are available on request. 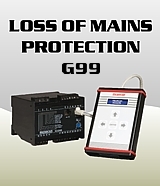 If output is used for remote meter reading, we recommend 0-1mA for the slave indicator. Both the reverse power (Import) relay (R1) and the overload (export) relay R2 is used to trip the generator breaker. Relay R3 is intended for notification of a reverse power condition, or can be used for local indication, as input to an alarm system etc. R1 and R3 will latch after trip. R2 are non-latching and have a adjustable hysteresis. 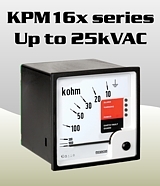 KCVA176A & KCVA176H have analogue output proportional to the generator kVAr-load. Both the reverse power (Import) relay (R1) and the overload (export) relay R3 is used to trip the generator breaker. Relay R2 is intended for trip of non-essential load or tripping of bus-tie breaker to split up the system to reduce risk of total black out. R2 and R3 are non-latching and have a 10% fixed hysteresis. KCVA176F & KCVA176HF have analogue output proportional to the generator kVAr-load. KCVA177A & KCVA177H have analogue output proportional to the generator kVAr-load. KCVA177F & KCVA177HF have analogue output proportional to the generator kVAr-load. 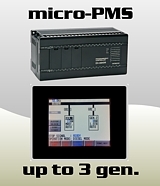 Depending on application, select the model that matches the electrical installation. If none of the listed models fit your purpose please contact Megacon for customer adaptation.